The Twin Clean Shopper is the perfect shopping cart cover for the double cart seats found in most grocery stores and warehouse stores. Not just for twins, the Twin Clean Shopper is perfect for siblings close in age. For ages 3 months to 3 years. Twin Factor is a great gift for dads of twins of any ages, from the sleepless first few months, to the tumbling toddlerhood, terrible twos, the emotional threes, the non-stop fours - and beyond. Let's face it, for those with twins, only three challenges a week would a cake walk. Available on black, gray, navy blue and white shirts. Twin Factor is a great shirt for any mom of twins. 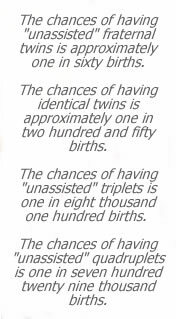 No matter the age, there is always a twin factor to deal with, whether its the sleepless nights, the trading of colds, the two-heads-are-better-than one scenarios, and the list goes on. Available in white or gray. The Twin Nursing Pillow is perfect for nursing or bottle feeding twins. Featuring Ultra Plush Stain Resistant Fabric, contoured shape, a back support pillow and a removable cover, the Twin Nursing Pillow is easy to use, easy to clean, and a favorite of twin moms every where.